I am fastidious about the details when it comes to developing our products, and when we decided to add a line of spinning fibre to our permanent range I tried out many beautiful fibres. I spun them in different ways, tested how they wash and wear, and of course how they absorb colour. I found some stunning fibres along the way (including utterly cloud-like merinos which we will continue to dye for the shop), but it became clear that the only way to achieve all the qualities I wanted in a fibre was to design our own custom blend. Meet Lustre Blend. It’s a luxurious blend of carefully-chosen fibres that embody everything we love: softness, warmth, bounce, texture and of course colour brilliance. It contains 2/3 fine British wools, blended with natural grey merino and Mulberry silk. Here it is in its natural form, pale grey with bright white flecks. 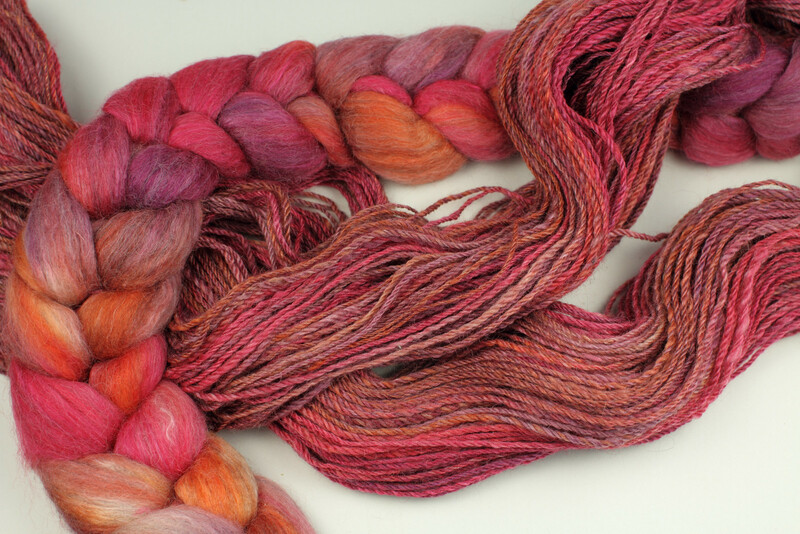 In addition to our hand-dyed shades, we have made it available in its natural state for spinners who like to dye their own fibre, or kettle-dye spun-yarn. It absorbs dye readily for rich, glowing colour – just look! We think Lustre Blend is quite unlike anything else out there, and these are the ingredients that make it special. Bluefaced Leicester (BFL) is a favourite native British sheep breed due to the fineness of its fibres. 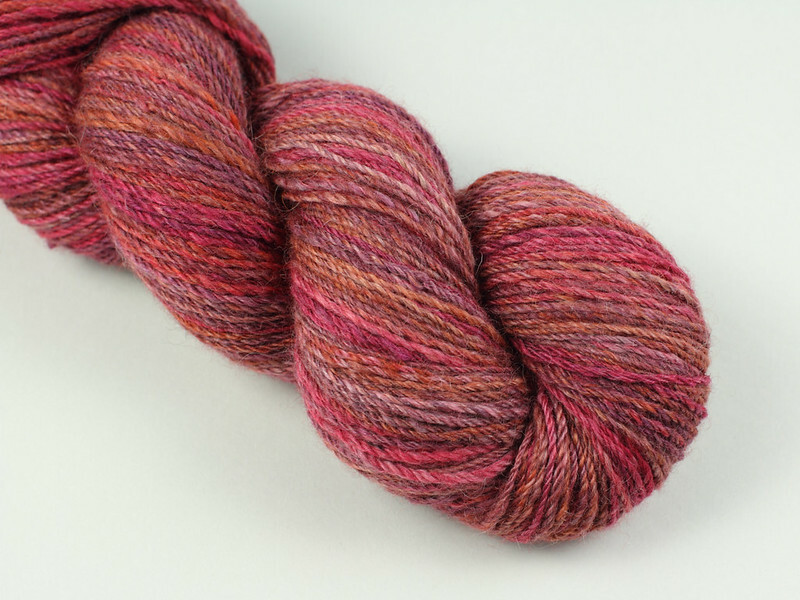 It forms a core part of our hand-dyed yarn range so it was a natural choice for our first fibre blend. 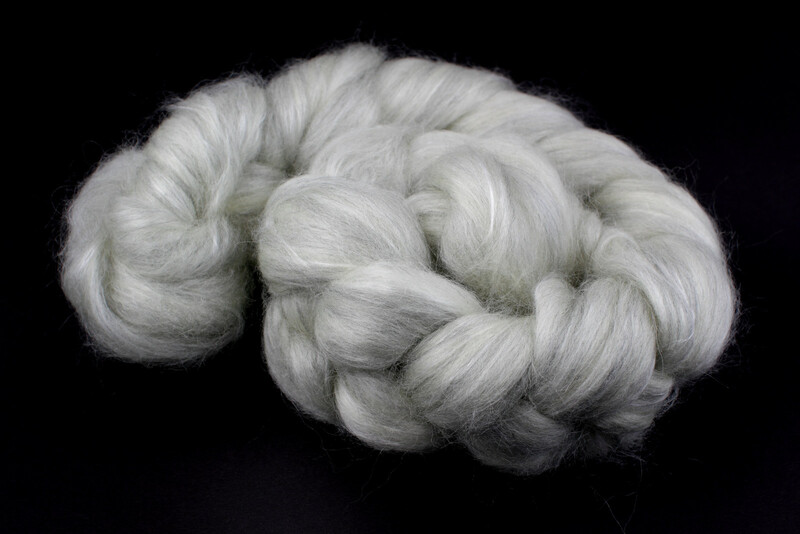 The fleece has a subtle lustre, unique to the breed, which gives it a beautiful depth of colour when dyed, and its long staple-length of around 90mm makes it a dream to spin and resistant to pilling. Our Bluefaced Leicester has been superwash treated for added resilience and softness. Another traditional British breed, Wensleydale fleece has a drape and glossy sheen quite unlike any other wool, often likened to mohair. We added a touch to our blend because of the incredible shine and intensity of colour of the fleece when dyed, thanks to Wensleydale sheep’s distinctively curly, lustrous locks. Wensleydale is a longwool, with staple of 200-300mm(!) so it also adds strength. Merino is a firm favourite with spinners and knitters for its fine fibres. By adding this unusual untreated grey merino, we’ve given Lustre Blend not just warmth, softness and crimp, but a hint of tweedy texture. Our grey Merino is non-mulesed, and sustainably farmed in South America. The fleece is then milled in the UK. Silk is the final ingredient in Lustre Blend, chosen for its luxurious softness, drape and shine – but not just any silk. Mulberry silk is a cultivated silk made by Bombyx Mori moth, which has a diet of Mulberry leaves! It is finer and brighter white than popular Tussah silk. It really is a very easy spin. The fibres are smooth without being slippery so there’s no need for pre-drafting (unless you do so for colour effect of course). The long fibres allow it to be spun fine and create a stable yarn with relatively little twist, and spinning it loosely is what I’d recommend to let the fibres be themselves and bring out the shine. The other effect of long staple fibres is that the colours blend and mellow. 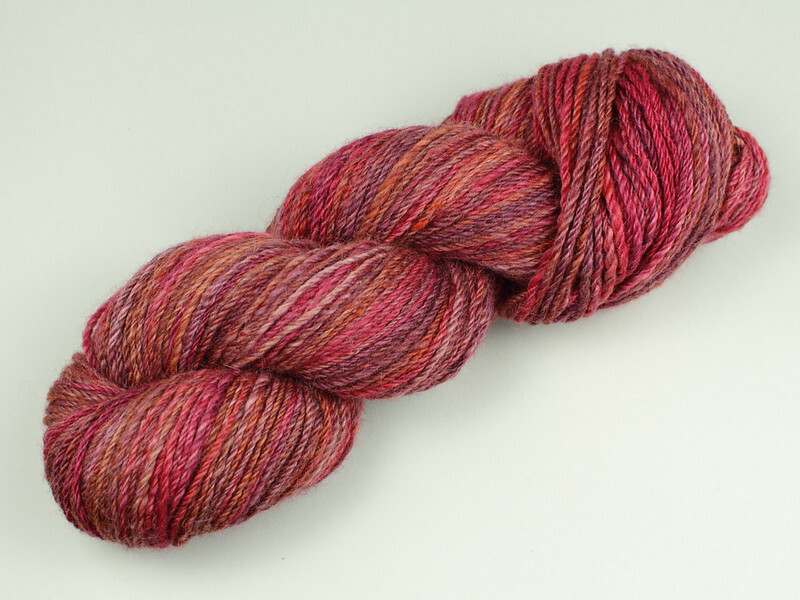 The yarn above was spun end-to-end and then chain-plied to preserve the colour definition (spun and plied at low speed), giving a DK weight finished yarn. My chain-plied yarns are normally a little stiff and stringy but this skein has kept its drape. It’s a glossy yarn but it also has a woollen texture about it. What surprised me the most is how much it plumped up after soaking – it’s springy! I spun this yarn with the intention of using it for Karie Westermann’s Rubrication shawl, but I’ve ended up with a perfect DK rather than the 4 ply I was aiming for! So, what to use it for? It would work for any DK project but would looks best on something that would show off the colour graduation. One of Woolly Wormhead’s Elemental hats maybe? 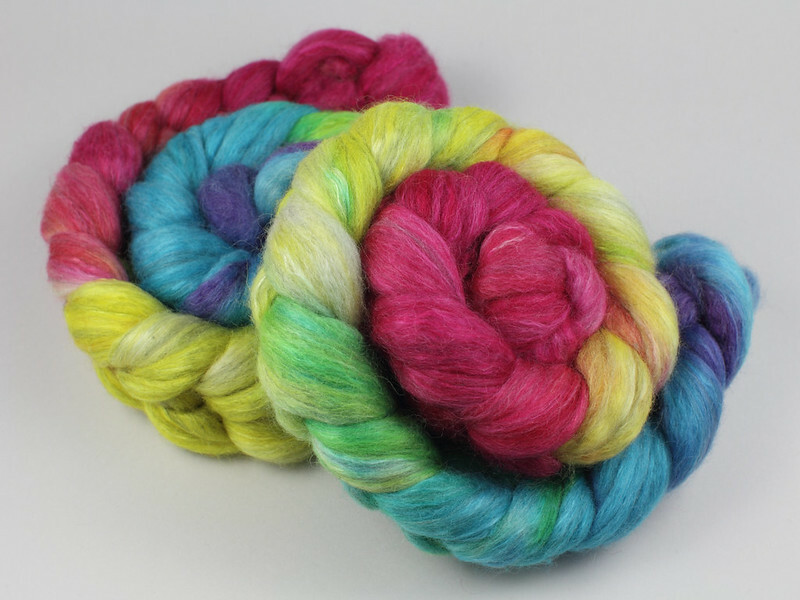 Lustre Blend is available now in 120g braids, to give you plenty to work with. 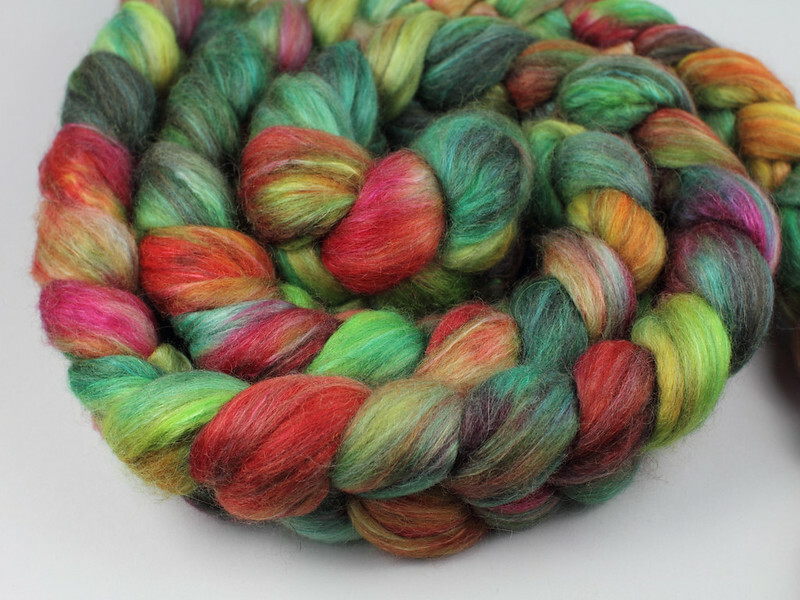 There are currently three hand-dyed colours, which are selling quickly, but lots more on the way!